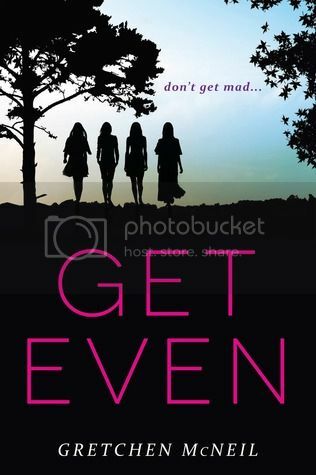 Get Even is the story of four girls with nothing in common that form a group, ‘DGM’, as a way to get revenge on the bullies and mean girls that terrorize their private school. But even though these girls work together to get revenge for the people that can’t defend themselves. But when one of their targets turns up dead and secrets about themselves start coming out, the group they started begins to slowly unravel. The four main characters in the story, Olivia, Margot, Bree, and Kitty, have absolutely nothing in common. Despite that, they manage to come together and form the group ‘Don’t Get Mad’ as a way to get revenge on the bullies that pick on the helpless that can’t defend themselves. I love that these girls wanted to get justice for the people that were bullied. I also liked that each of the girls were so different from each other, and even one having been bullied herself. They were a really diverse group of girls, and I’m really looking forward to getting to know them more as the series goes along. I really, really enjoyed the storyline for the book. I found it to be extremely engaging, and it kept me engrossed throughout the whole book. I loved the mystery and the fact that when I finished the book, I still had no freaking idea who the bad guy was. I’m completely in the dark. Just when I suspected someone, I was proved wrong. ARGH! The book ended with a massive cliffhanger. MASSIVE! It’s kind of killing me that I have to wait until next year to get the next book in the series. I need it NOW! Also - this book would make a really awesome tv show. Just sayin’! Overall; I really enjoyed this book! It kept me guessing and turning the pages and I can’t wait to get my hands on the next book in the series, Get Dirty, out May 2015! it. I've been looking forward to this! I'm really glad you enjoyed it. Looks like I won't be disappointed when I get my hands on this soon (I hope...). I love page-turning mysteries (but not massive cliffhangers).